Superhero films are never a drag for me. There are very few that don’t actually entertain me in the slightest, but there are even less that let women really shine. I’ve seen countless films about women of course, and those experiences have been varied. However, hardly any of them are as much an unadulterated celebration of empowered womanhood as Patty Jenkins’ Wonder Woman is. What Jenkins does with this film is an example of how the established cinematic canon can, in fact, work in a woman’s favour. A beautiful, well-made film by genre standards doesn’t need to cater to a ‘male gaze’ in the slightest. 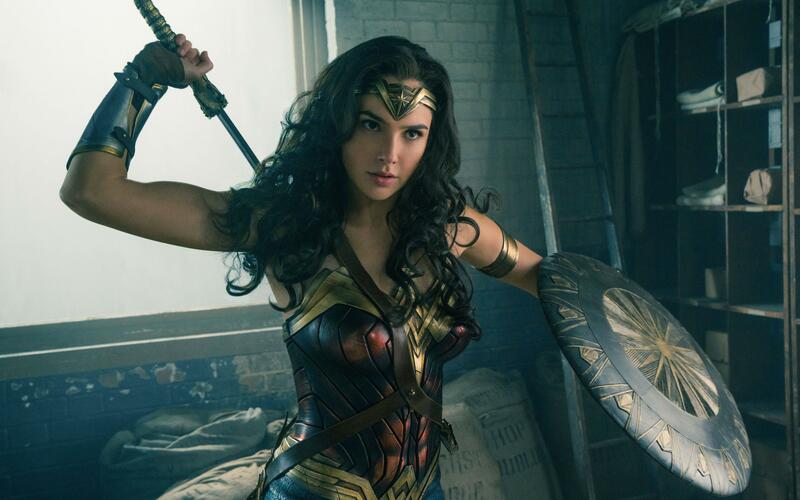 Casting someone like Gal Gadot ruffled many a fanboy’s feathers for a myriad of ridiculous sexist reasons, but she proves herself more than capable of carrying a gargantuan movie like this, regardless of what she looks like. Wonder Woman may have a specific appearance as a character – the iconic costume, her weaponry – but it’s what’s in her heart that truly matters here. The film manages to capture Diana’s Goodness perfectly. It results in such a genuine experience of the narrative because beyond the overused war backdrop is a woman whose heart is pure and who doesn’t need grim-dark corruption to be deemed worthy of anyone’s time. Diana starts out almost too innocently, but the way she organically comes into her own is a treat to watch. Gadot brings sheer delight to the character, something rather naturalistic yet fiery and confident. It’s a wonderful mix for someone as gutsy and even foolhardy as Diana in her youth. It’s easy to become invested in her. Bringing about a great balance to Gadot’s energy is Chris Pine. It’s now official that two of my favourite fictional Steves are played by amazing Chrises. Pine is a great amalgam of cocky, unsure and deeply heartfelt as Steve Trevor; someone who falls into Diana’s world so swiftly that it feels like a dream. He really plays her ‘other half’, rationalising when necessary yet stepping away when she requires it. There is a real sense of respect between Steve and Diana. He never holds her to anything unrealistic, but he’s determined to protect her. It creates a far more intricate and intriguing dynamic between them than I was expecting. This is my main takeaway from Wonder Woman. There are conversations throughout the film that are politically charged and important, without taking away the sheer ‘wonder’ of it being a summer blockbuster superhero flick. It’s a proficient combination of both, coupled with sheer endearment and wholesomeness without it being sickly. What I love about the film is that there are amazing action sequences peppered between the critique of violence and war, and this is all handled deftly. Jenkins had to juggle many things here. Wonder Woman has to be an individual origin story, but it also has to serve as the perfect vehicle for a solo superheroine – all this surrounding a much-loved character in the DC verse. Thankfully, she succeeds in spades. I think that it would have been impossible for me to walk away from this film without feeling a sense of gratitude as a woman and as a fan of superheroes onscreen. There are definitely parallels between Jenkins’ film and other stories I love. However, Wonder Woman certainly has a lot more going for it than my heart and accompanying emotions splayed all over the floor (as I’ve finally – finally – seen a woman carry a gigantic mainstream film in such a way). It revamps what we know works for films like these – or rather, what we’ve been told works. It is an affirmation of people willing to give women a chance and having that pay off remarkably well. Let’s hope that DC can keep up with these wins. Nice review.